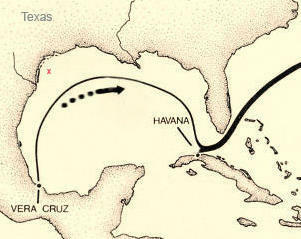 Four vessels began the journey loaded with about 400 people—old conquistadores and Spanish families heading for home, merchants whose wealth was stored in the ships’ holds, and soldiers eager to see their homeland—plus bars of gold and silver bullion, and chests of freshly minted coins. 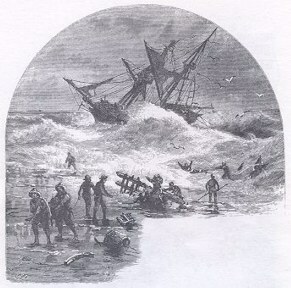 Twenty days into the Gulf of Mexico, a vicious storm hit with such force that the ships fought to stay afloat. One vessel, the San Andrés, which was severely damaged, limped into port at Havana. The other three, the San Esteban, the Espíritu Santo, and the Santa María Yciar carrying about 300 passengers, tossed without control until all three ships sank within two and a half miles of each other about a half-mile from the coast. Over half of the passengers, grabbing anything they could find to save themselves, drowned before reaching shore. 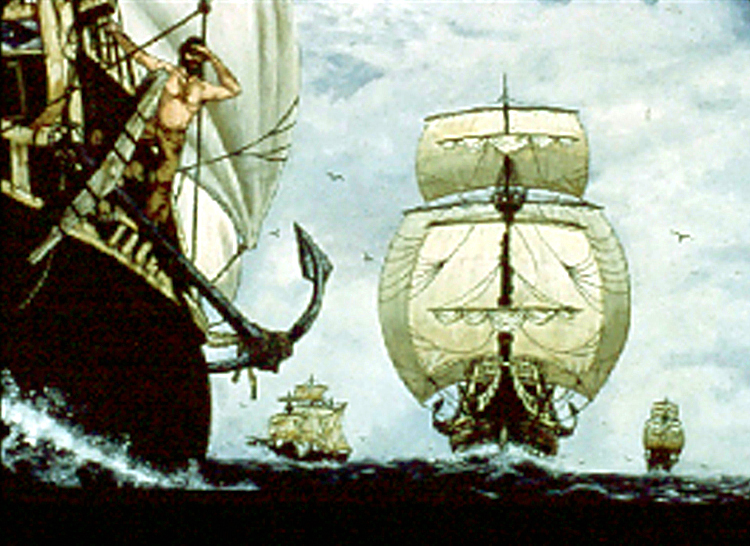 Only the San Esteban remained visible above the waves and its master and a group, probably the most skilled sailors, managed to save one of the ship’s small boats and sailed immediately for Veracruz to seek help. The survivors, huddled together on shore, managed to save a large quantity of food and supplies. Believing they were within a few days march of a Spanish outpost, they began walking. Actually, they were 300 miles from Tampico. Only one man, Francisco Vasquez, elected to remain with the wreckage and wait for rescue. The group met local Karankawa Indians and accepted the natives’ offer of food, only to be attacked when they reached the Karankawa campsite. As the Spaniards fled, some of them stripped off their clothing thinking that’s what the Indians wanted. 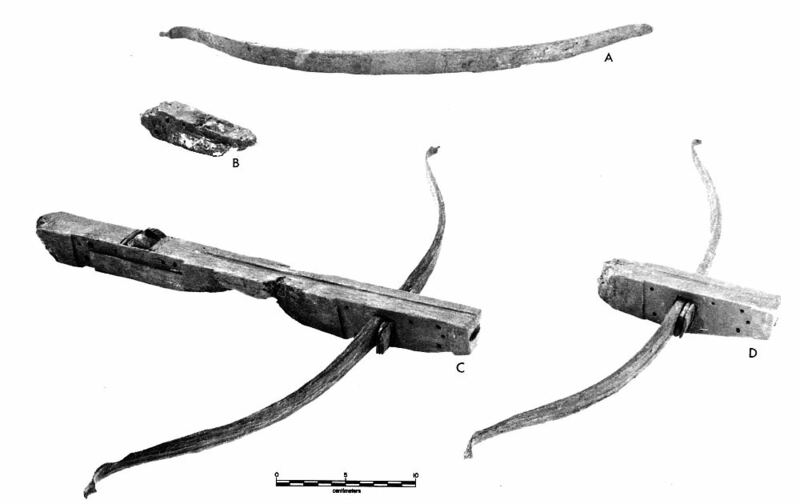 The Indians continued the chase, killing the terrified survivors as they ran and inflicting others with arrows including Fray Marcos de Mena who took seven arrows. His companions, thinking he would soon die, buried him with only his head exposed hoping to protect his body from wild animals. The warmth of the sand apparently revived Fray Marcos, and he dug his way out. As he continued walking, he came upon the ultimate horror—all his companions lay dead. Fighting mosquitos, hunger, and thirst, he pushed on, finally coming to a river only to discover that it was salty. Two Indians found him, gave him food and water, and as they carried him on a bed of hay, they kept saying only one word, “Tampico.” The village lay only a short distance away. When Fray Marcos’ report of the wreckage verified the account of the survivors who had returned earlier on the boat, the viceroy ordered a salvage expedition to retrieve some of the most valuable cargoes ever to leave the New World. When six salvage ships reached the site in July 1554, they found the emaciated and joyful Francisco Vasquez and the partially exposed San Esteban. Divers uncovered and hauled almost 36,000 pounds of treasure back to Veracruz, about 41 percent of the original cargo. Four hundred years later, in 1967 the Texas General Land Office received information that an out-of-state salvage crew was recovering artifacts off Padre Island near Port Mansfield inside the 10.35-mile coastal boundary the Supreme Court had ruled belonged to the state of Texas. The company doing the recovering was not licensed to operate in Texas, and after several years of lawsuits Texas recovered all the artifacts and the salvage company was awarded over $300,000. 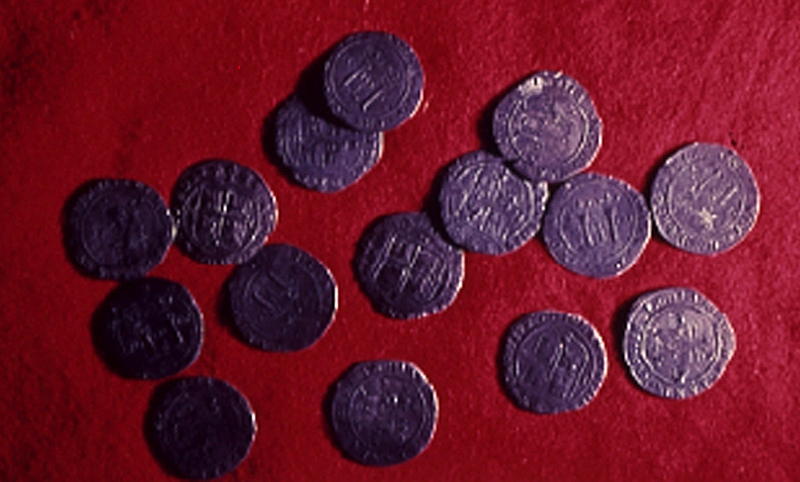 The thousands of treasures, encrusted with centuries of hard calcium carbonate deposits, included a small solid-gold crucifix, a gold bar, several silver discs, cannons, and crossbows. Astrolabes, extremely rare navigational instruments used in the 16th C.
The most valuable find were three astrolabes, extremely rare navigational instruments used in the sixteenth century. The Texas Legislature passed an Antiquities Bill in 1969, which protects and preserves archeological landmarks and resources and sets strict limits on salvaging and excavation by individuals and companies. Although the Santa María had been destroyed in the 1950s during the dredging of the Port Mansfield Channel, excavations in the 1973-74 season, used more advanced techniques to probe the layers of sand and shell to reach the treasures lying in a thick deposit of clay. Over 26,000 pounds of encrusted artifacts were recovered, including a large enough fragment of one ship to estimate the length of the vessel between seventy and ninety-seven feet. After the materials were processed and catalogued, the Corpus Christi Museum of Science and History was named repository of the collection. I do not understand why the unlicensed salvage company was awarded $300,000. It seems like the artifacts should have been seized not “bought” if the operation was illegal. The ships were in fairly shallow water and the San Esteban remained partially above the water. Thank you for following. Can hardly imagine how ‘divers’ of the era the ships went down were able to salvage anything! Seems it’s been a lucrative business for divers with all the new technology. Good there have been laws to protect what is find, the artifacts become so valuable historically. Thanks again Myra!